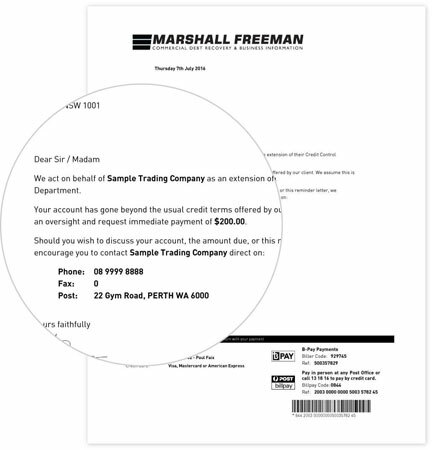 Marshall Freeman is Australia's leading debt collection agency, helping both large and small businesses effectively recover bad debts. With over 15 years' experience and trusted by over 20,000 businesses, we are Australia's preferred debt collection agency. Our experienced team of collection experts are trained and solely dedicated to helping you reduce your overdue accounts and prevent bad debts at minimal cost to you. By leveraging the latest technology and applying proven recovery techniques, we make your overdue a priority so that you get paid faster. Professional in approach, whilst offering a hassle free collection process that is focused on safeguarding business relationships, is why we are Australia's leading debt collection agency. Whether you're located in New South Wales, Queensland, Victoria, South Australia or Western Australia, we can provide market leading debt collection services to help improve your cash flow and reduce your risk. If you're looking for a debt collection agency that gets results, please get in touch as we are able to collect debts most other collection agencies write off.